Soothe and Cool No Rinse Perineal Spray, manufactured by Medline, is a no rinse perineal spray that is non irritating to the skin. Perineal sprays are designed for patients with incontinence. This product is used to soothe, clean and deodorize the perineal area of the patient. Perineal areas of the skin can experience prolonged moisture and irritation. This is usually caused from incontinence and left untreated can progress to more serious conditions like infection. An excellent remedy to these conditions is the cleaning of the skin with a perineal cleanser like this product. Cleansing the skin is an important part of caring for incontinent patients. Often times the cleansing must be done bedside or where soap and water are not readily available. This product features a no rinse formula making it perfect for bedside incontinence cleaning. 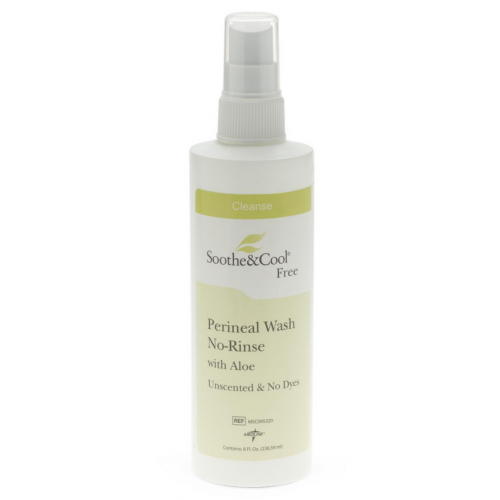 This spray cleanser is non irritating and contains soothing aloe, making it perfect for patients with sensitive skin. Just spray and wipe clean, this item is very convenient and makes patient clean up easy. An additional benefit of this product is that it deodorizes as it cleans. This is done with an unscented solution that will not mask the odor but rather eliminate it, making the need for additional deodorizers unnecessary. BUY Soothe and Cool No Rinse Perineal Spray from Vitality Medical today.